We spent $104.17 on Christmas this year. Yes indeed, yet again we’ve managed to frugalize what is possibly the most consumeristic holiday of the entire year. Mr. Frugalwoods and I routinely disappoint retailers and let down the economy, but it’s particularly egregious during this season of revelry. Basically, we’re a menace. But, despite this meagre amount, we’re not skimping on the mistletoe or giving used dental floss as gifts. Nope and nope. We’re having a lovely Christmas while still meeting our 65%-85% savings rate. I don’t share this to brag. I share this because many people don’t even consider it possible to have a happy, thrifty holiday without maxing out budgets and stress levels. With the spending hangovers and debt that people wake up to in January reaching record levels, I just want to share that there’s another way. It is possible to enjoy life the frugal way. I’ll start with the one thing we actually did spend legit money on other than food: our Christmas postcards! I’m sure you’re shocked to hear that we love taking photos and sending out photo cards every year (yes we are those tacky people whose faces show up in your mailbox). Despite our ultra frugal, hipster tendencies we’ve always enjoyed sending out cards–I never said we fit into a stereotype, folks. The cheapest way to send anything through US mail? Via postcard. The stamps are a mere $0.34 each (vs. $0.49 for regular stamps). Plus, postcards are smaller so they’re less expensive than regular cards and don’t require envelopes–yet another money saver. I always use Vistaprint to design our cards and, here’s my trick: I select a business postcard template and simply delete all of the “business-related” text like “on sale now!” (though that actually might be appropriate for us…). For some reason, the business postcards are a fraction of the price of regular old “holiday” cards. No one will be able to tell (except for everyone who just read this). 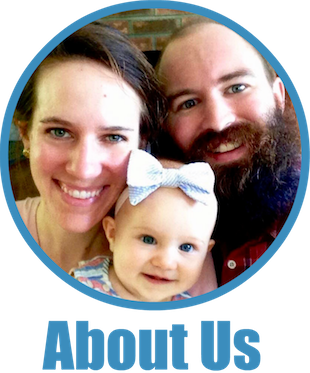 I uploaded our smiling faces to Vistaprint and popped ’em into the spot on the card where you were supposed to list your business info (see our actual card, with a few Frugalwoods modifications, above). The cards cost a cool $18.18 for 100 and the shipping was another $9.99 (dang shipping!). 100 postcard stamps rang up at $34 for a grande totale of $62.17. Not too shabby for full-color front and back photo cards! 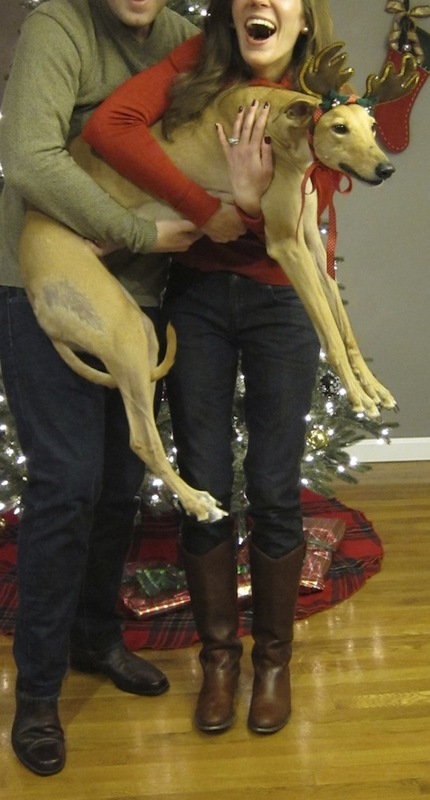 We like to have a Christmas photo taken every year, but we’ve certainly never paid anyone to snap it for us. Our trusty trash tripod works like a charm. Mr. FW sets it up in front of the Christmas tree and programs our camera to take 5 photos in a row. Our strategy is to repeat that process until we have a few decent shots. 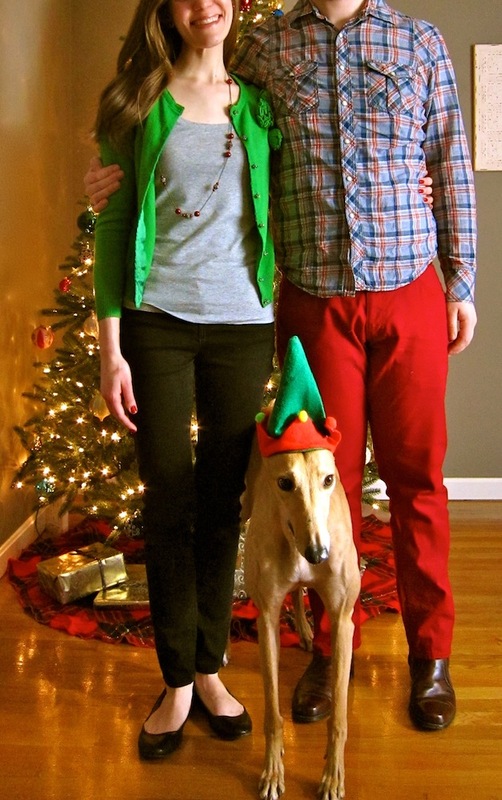 I then edit the photos in iPhoto and voila: A Very Frugalwoods Christmas. Self-photography for the win. As I shared in my first Woot & Grumble of the month, we don’t travel for the actual Christmas week. Instead, we save major bank by flying during the cheapest travel month of the year: our buddy January. Mr. FW and I’ll be flying from Boston to San Diego for a sweet $216/person round-trip as opposed to the exorbitant prices advertised for Christmastime. 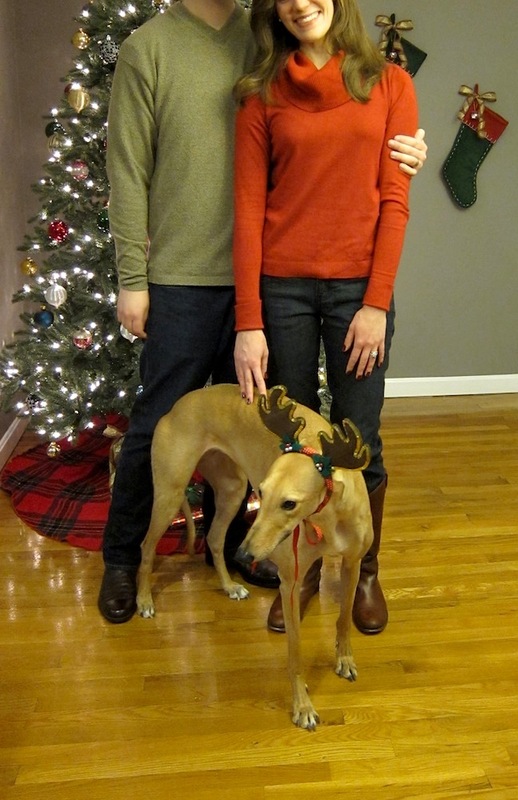 So we’ll have a cozy husband, wife, and hound holiday here at Frugalwoods HQ. Mr. Frugalwoods and I decked our frugal halls for free since we have artificial decor that we re-use every single year. The start-up cost for our festive tidings wasn’t free, but, we combined our purchases with hand-me-downs from family for an overall reasonable price. We’re on our sixth year with our decor and hopefully we’ll be using it for many years to come! You guys know I’m NOT pulling that sleigh, right?! There are no store-bought cookies or cakes in this house. Since we’re not hosting anyone for Christmas, our grocery costs are nearly on par with our normal expenses. There are a few exceptions since we’re cooking several special Christmas dishes traditional to our families: shoo fly pie, breakfast casserole, and sugar cookies. We also procured a bit of chicken from Costco in order to make Chicken Spiedini–a recipe from one of my best friends. It has become something of our traditional Christmas meal and, as we rarely buy meat, that was definitely a higher expense on our bill for the month. I estimate we spent $40 above our normal frugal grocery expenses. No cobbling done here. Hate this hat. Yep, you read that right. We spent $0 on gifts this year. And no we’re not Scrooge McFrugalwoods! We gave gifts to all of our family members–we just happened to buy them all through Amazon using our Amazon.com cash back rewards points. 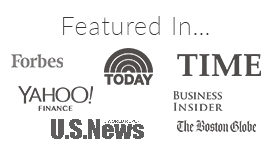 Our Amazon Visa card accrues points for free Amazon merchandise every time we use it. Since we concentrate most of our spending on this card (the only other credit card we have is the American Express Starwood Preferred Guest) we’re able to reap significant rewards. This is why I strongly advocate using credit cards IF you can spend judiciously and stay out of debt. We pay our balance off in full every single month and absolutely clean up with rewards points. Free Christmas gifts, people. Free. 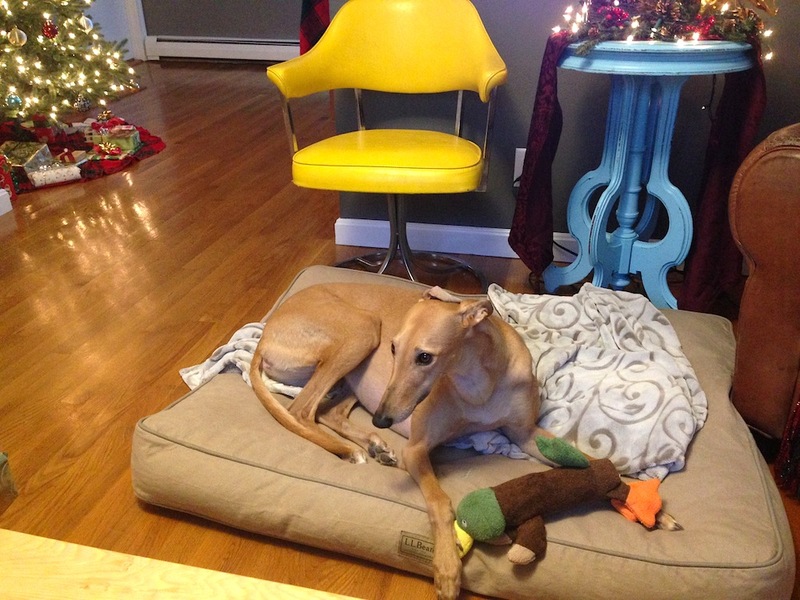 Frugal Hound is on the “nice” list this year, per usual, and will receive a squeaky pterodactyl toy we bought for $2 at Ocean State Job Lot (a store even tackier than Wal-Mart in case you were wondering). We also have it on good authority that her paternal grandparents sent this gigantic stuffed toucan for her hound delight (affiliate link). She’ll also receive a few bits of chicken on Christmas… hound heaven. Mr. Frugalwoods and I aren’t exchanging any gifts this year, only love. Our preference is to save the money and put it towards a future weekend trip together–perhaps up to Vermont for more homestead hunting and hiking. I think skipping gifts is a wonderful route to take in a mature relationship. You know you love each other, you invest in your relationship on a regular basis, and trinkets are meaningless at this point. We’ve exchanged gifts in the past, and we might again in the future, but this year with our homestead goal so close at hand, we just want to plow every extra dollar into savings. And we’re not the only frugal folks who adhere to this policy–John at Frugal Rules isn’t exchanging gifts with his wife either. I encourage this approach with the caveat that it’s something both people need to agree on and feel good about. It should be a decision that’s thoroughly discussed and made mutually. And, if you do agree on no gifts with your honey, don’t be a jerk and give them a gift anyway. They’ll feel like reindeer poop since they adhered to the agreement and you’ll feel awkward for breaking their trust. We’re kissing a dog… yuck! Mr. FW and I are staunch believers in the concept that everything in life can be done frugally. There are prevailing cultural beliefs that you have to spend a lot in order to celebrate a lot, and I don’t buy that. It’s just not true. I hope you have a wonderfully festive, frugal, and loving holiday season with your family! How much did you spend on Christmas this year? What are your tips for keeping your frugal wits around the holidays? I did dress Kitty PoP up in his santa outfit yesterday, and for spending $1 on that 6 Christmases ago, it still brings us a ton of joy. Kitty PoP loves how many treats he gets when he wears it… and I love seeing him in it. Mr PoP thinks we are both ridiculous. Thank you so much, Lindy! I really appreciate it :). 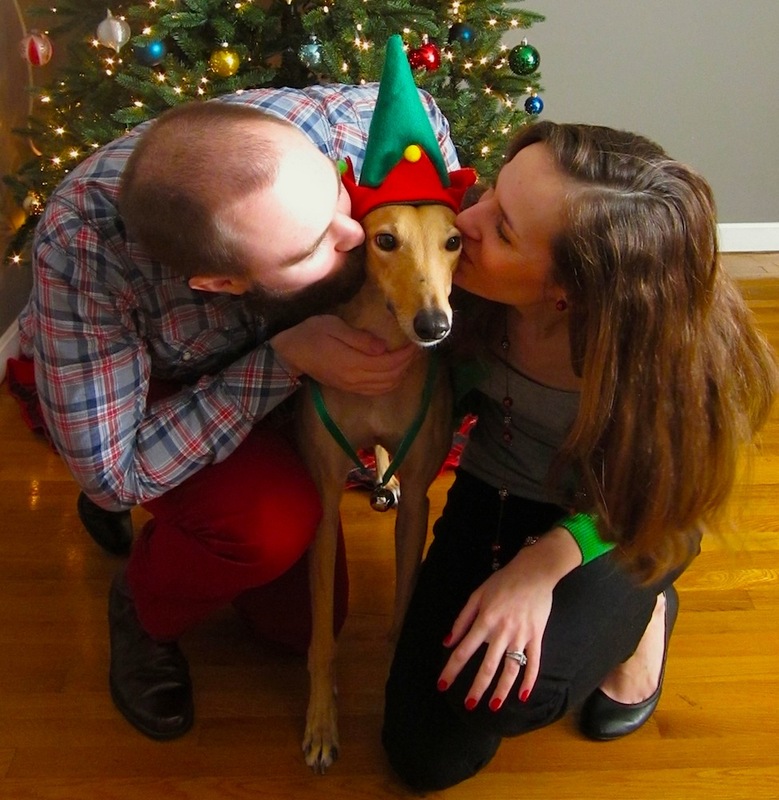 Frugal Hound is definitely hilarious in her little costumes (although I doubt she agrees :)). Merry Christmas and Frugal New Year to you too (I really like that, by the way!). We are definitely an ongoing disappointment to the entire retail industry ;). Happy holidays to you too! Sounds fantastic! The Big Guy & I did exchange gifts this year, although we limited them to practical things with a budget of $50. Money well spent, I think :-). We actually spent less than that on the baby, with most of her gifts being picked up at yard sales this summer! Sounds like you’ve got a great system! Love that you found baby gifts at yard sales–that’s the way to do it :)! Great photos! I have to agree with the concept of Christmas not being about money or the cost of a gift. I think it should be about bringing people together to enjoy unrivaled merriment. It is truly a wonderful time of year and it’s awesome the FW’s enjoy it as such. Have a Merry Christmas and an outstanding New Year! Agreed. Not about the money at all :)! Merry Christmas and Happy New Year to you too! We spent more than you because we have kids. Fortunately, my kids are still young so they still enjoy small, frugal gifts. I mostly bought them craft stuff this year because they love to create. Other than that, I bought them clothes, and stuff they might actually use- like a sleeping bag for when we go camping this summer. My big splurge was a used wii off craigslist and the game “Just Dance.” That one isn’t from Santa- I’m getting credit for that! Great idea on the craigslist wii! Not like it matters that it’s used, and I bet you got a great deal! Love the Christmas Card! Hubs made ours this year and it was $80 before postage (which was free because a family member gifted us a roll of stamps.) Thanks for the tip about Business postcards. I’ll see if I can convince him to make the shift. I’m putting a pic of my debts being paid off on the card for 2015. Could be weird, but I’m going for it! Hah! I think that’s a great idea! It’s an important milestone that you’ve worked so hard for… might as well make it part of the yearly wrapup card! Thanks for the mention, much appreciated! I could not agree more that you need to make sure your significant other is on board with the plan. If they really enjoy getting a gift, and who doesn’t, then you need to make sure they value something else that much more. We spend more since we have kiddos, but over 2/3 of what we budget for them is going in their 529’s – which I’m happy to “spend” that money as I know it’s not going towards another piece of junk to clutter our house. Your tix to San Diego are killer! My wife is a San Diego native and we can usually get around $250 or so from Omaha but it has been sometime since we’ve seen a price that good. It really is infinitely easier if everyone is on the exact, explicit, same page about gifts. Some people might call it unromantic… but I think a clear line of communication is just about the most romantic thing imaginable. We opted to not send Christmas cards this year, I’ve never considered postcards before! That’s a great tip. Plus, you get to wish all the post-people Merry Christmas along the way too. We plan to spend about 5 times as much as you on Christmas! Our big costs are gifts for family members. Our Little Miss has got a few presents from us and the Mr. and I are exchanging stockings this year. Then gas to travel out of town to see my parents/extended family. We’ve sent full cards in the past, but then we started noticing that everyone was just putting the cards on the wall or fridge… not really using their card-like properties! So a postcard still gives people something to enjoy, but also makes it much more sustainable for us long term. Win/Win! Also – I was shocked to see a pic at the bottom with your eyes showing! Well, almost showing haha. We’re gradually coming out of the blog-anonymity closet…. It really was too good of a photo to not include. Frugal Hound looks so not amused! I’m still trying to convince my family to tone down on the gift giving… Maybe next year because they’re not going biting yet. And I really want to know… Has anyone ever actually has figgy pudding?? Haven’t had figgy pudding, though I bet I’d like it. Both figs and pudding are high on my tasty list! We did taste some sugar-plums the other night. Pretty tasty. Not real plums. Who knew? I tried sugar plums for the first time two weekends ago! Mine were like dried plums, aka prunes, rolled in a sugary goo. I wasn’t sure if I liked it or not. What were yours like? They were gummy sugar plum candies that our friends brought over–delicious, but methinks not the real deal. Yours sound more genuine :). I do actually like prunes, so I’d probably love those. Congratulations on your frugal Christmas! I think this is an inspiring story, and I have to say I’m impressed! I spent nothing in terms of events / decor (I reuse and we’re going to see The Trans Siberian Orchestra in my work suite for free). But I did spend on gifts. That is because I refuse to use a credit card. I like to shop and they’re just not for me. Unfortunately, that means cash money on gifts. But I stay on budget and it’s never a problem. And really, I always make back more because my grandparents and parents tend to give very generous holiday monetary gifts. 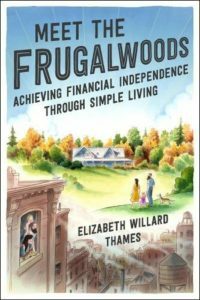 Merry Christmas Frugalwoods!! How cool that you get to see the Trans Siberian Orchestra! They’re definitely a constant in our holiday music rotation. I bet they are awesome in concert! Hmm, haven’t totalled ours up. We already have probably $30 invested in presents for our two tots, some new books and consignment sale toys and puzzles, but I haven’t bought stocking stuffers (these will be along the lines of candy and stickers, not dollar store junk). Presents for my family, another $35-40. (My siblings and I have a long-standing agreement that our gift to each other is permission not to buy each other gifts.) We did not send out cards this year because I got a new job and actually FORGOT about cards until it was too late! Will send an e-mail perhaps with new address and pics of boys. Also did not put up a tree for the same reasons–I wanted a tabletop tree and couldn’t fine one by the time we started looking. No other expenses as we are flying home, all expenses paid by my extremely generous parents! Aside from the odd grocery store run or whatever, and maybe coffee at a quaint independent little shop downtown with old friends. Mr. FP and I usually fill stockings for each other, but are giving it a rest this year as we’re just a bit overwhelmed. I’d like to do more for Christmas next year when we’re more settled! Wow, $30 for 3 kids! YOU need to write the post on this, not us! 🙂 Have a safe and fun trip! Thanks for the good wishes! Just TWO kids. Gotta establish reasonable expectations early :-). I love your into….we let down the economy! We save throughout the year for Christmas, so we were not exactly frugal, but we came in under budget! We don’t get anything for each other either. We would rather spend that money on trips or experiences throughout the year. Thanks! We should have some sort of “Terrible for the economy” club. Thankfully for the country, there are plenty of folks on the other side of the equation to more than balance our lack of spending! This is probably our most frugal Christmas yet. Hubby and I will exchange three very inexpensive items and then Will came in under budget with his requests. He actually has had a “Santa” budget the last three years and he is really good about keeping his requests within or under budget. A Santa Budget! I guess it’s not a stretch to imagine the big guy needing to live within his very generous means. 🙂 And what a great idea to set family norms about reasonable amounts to spend. My best friend and I have just this year agreed to stop exchanging gifts and to begin a tradition of writing a letter to each other in December. And I bet you’ll keep those letters long after you would have worn out or stopped using a traditional gift! Love it! We make a family Christmas video every year, post it on YouTube, and forward the link to our friends and family. What a great idea! I bet it’s a lot of fun to make too :)! You are a genius. I love the postcard idea. Seriously, you are so genius, you are my heroes of the week! I couldn’t bear to give up the Christmas card tradition to save some $, but my eye twitched with every expensive stamp I put on an envelope. Postcards – just genius!!! I was shocked how nice the “business” postcards turned out. We prepared ourselves for something way less nice than what actually arrived. They are great, and the photos came out looking awesome. Totally not worth the money to get premium postcards. I’m going skiing up in CO though, and that’s going to cost me. But I count that as experience, so it’s worth it. However, my brothers wife works at the resort, so I can get 1/2 priced tickets, and I’m lucking out w gas being so cheap at this time. And of course I have a place to stay. So all in all it won’t kill me. 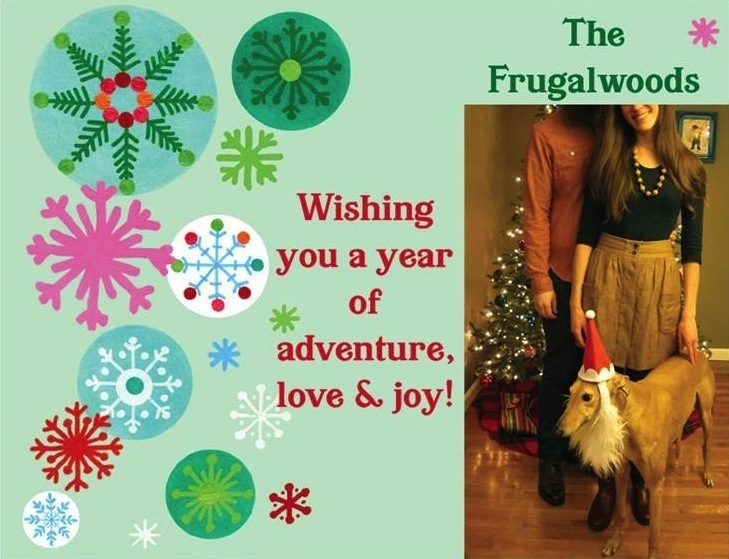 Merry Christmas Frugalwoods & many treats to FrugalDog! Hah! Mrs. FW whipped up the headless card for demonstration purposes. The real card has our smiling faces on it. That ski trip sounds both frugal and really fun! And yeah, gas prices are helping everyone’s christmas budget these days. About time we all got a nice surprise at the pump! Merry Christmas to you too! Frugal Hound has already started to receive extra treat rations for the season. Much grunting has ensued. Love how diverse Frugalhound is–I’m surprised there isn’t a side hustle as a model for that lady 😉 Travel expenses take up the majority of our holiday budget. I’m a big sucker for seeing everyone around Christmas time, but i can un-see that January roundtrip airfare. 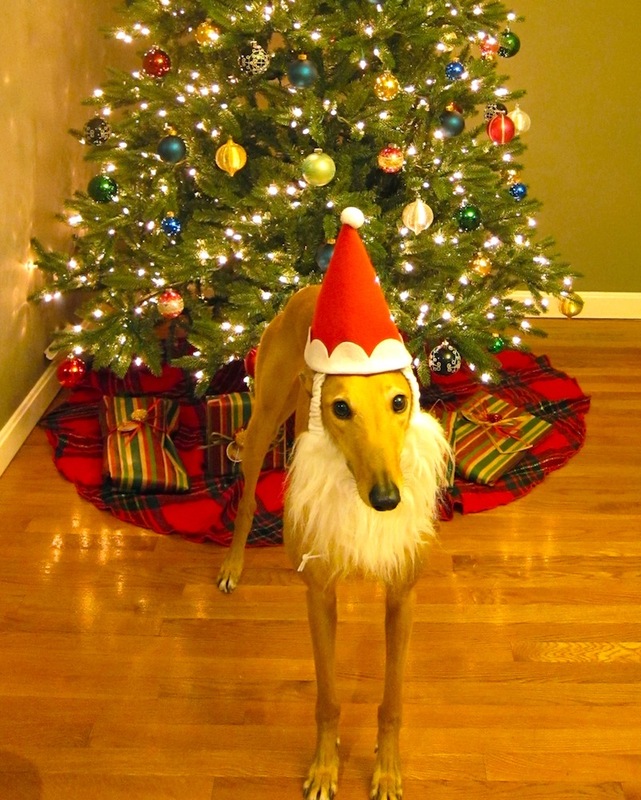 I laughed a little each time for the Santa frugalhound pics. Great job being frugal over the holidays, we did our Christmas trip earlier in December saved a few dollars, we did not come close to the $100, but I think we did a good job buying presents for our immediate family, nothing outrageous. Nothing like feeling content with your decisions during the holidays. That’s the real message here anyway, I think. Merry Christmas to you! Ooohh we’ll have to check out the costco options next year. Vistaprint is pretty easy… though paying for shipping always rubs me the wrong way. I love sending Holiday cards too : ) I feel like Holiday cards are a bit of dying trend unfortunately. I love sending and receiving them but I think my friends think I’m old fashioned or something. Whatever! This will be a more expensive Christmas for us than last year. We’ll be traveling to Chicago to celebrate w/hubby’s family.. On the plus side, we’re traveling Christmas eve and the flights were significantly cheaper than flying out earlier. We’ll also be staying at my sister-in-laws house which saves us atleast $80/night in hotel costs. We love cards too! It’s nice to be able to give them to friends and family, many of whom we aren’t able to see in person all year. Nice job flying Christmas eve! Haha I kiss dogs allll the time! Love that green sweater btw. We send cards and even though postage is expensive, I don’t want to give that tradition up! A post card is very smart – good thinking! Some dogs are just inherently kissable! Postcards seem to be a real winner for us. If we have more to say, we’ll send an email as well. I think people just want something to put on their wall/fridge. You can also buy card stock at any big office supply store and use free card templates from the Avery company online to design your cards and print them at home. No shipping, and very fun. I have not done postcards, just folded cards with envelopes. Good idea! We don’t have a printer at home (we’d honestly never use it) but if we did I bet we’d be trying this out! Christmas is not very frugal for us this year. We will be traveling to visit family and have to rent a house (for our dogs). We also still have to get presents for the young children in our family too. It will still be fairly cheap though thanks mostly to credit card rewards though. Awesome job on being frugal. I also disappoint retailers! Those pics of you and your family are tooooo cute! I thought I was doing pretty good on a frugal Christmas, but think I will need to put more thought into next year. 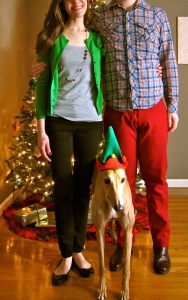 Love frugal hounds Christmas attire. Would you be willing to share the breakfast casserole recipe? I think we are going to have company and a casserole sounds quick and easy. I don’t use worcestershire sauce, and I use more egg… but that’s basically it. I prepare it on Christmas Eve and then pop it in the oven on Christmas morning. Makes the house smell amazing! Merry Christmas Frugalwoods Family! Great post and reminder to all this holiday season! For 2014, I got $275 cash back just on my credit card alone. Everything Christmas related costs ~$248, so this year Christmas costs $0 plus some left over theorectically. What we did spend $ on: gifts for our six nieces and nephews $209 (Amazon Prime saves Christmas once again), $14.50 for holiday meal extras for us (champagne and pomegranate). We did have a holiday party/dinner we went to Saturday which required a roasted veggie/quinoa dish to share with 28 people ($12) and a white elephant gift ($13 for good coffee and cocoa). .
What we didn’t spend $ on: holiday cards (don’t do them), decor (we have it, we just don’t drag it out because I hate putting it all away, that is right no tree either), gifts for each other or family (we always say no gifts please, but sometimes they don’t listen). Lastly, no plane tickets! Going on year two of not flying anywhere for Christmas for the second time in either of our adult lives. After 15 years of tickets, travel and crowds, we’re kind of on a hiatus and it’s kind of nice! We’ll visit when the tickets are cheaper. Maybe. There will be plenty of free winter fun had though. We are so close to the mountains, so cross country and backcountry skiing are both free for us and we do a lot of it regularly. There is the gas to get there. The various trailheads are 2 to 35 miles from our house. Shannon, you are doing amazing! Sounds like we’d be fast friends! Negative holiday expenses definitely takes the cake! Enjoy your quiet Christmas at home, we certainly always do. There’s something nice about being cozy in your own bed on Christmas morning. Sounds like you won’t be bored! Have fun! The levels of frugality y’all reach never ceases to amaze me. I love our Christmas cards. I found a Groupon to get a double sided card on thick paper for less than the postage. I made them double as a birth announcement for Mini Maroon #2 too. I also made that postage work extra hard for me by including thank you notes from baby gifts in the envelopes as needed. The rest of Christmas is not nearly as frugal since we exchange with six other adults, the two of us and two kids. We are trying to convince the rest of the family to cut back, but its slow going. We aren’t there yet, but I’m going to start celebrating the progress instead of lamenting the fact that we aren’t all the way to where we want to be. P.S. 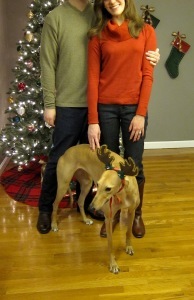 I love the look of sheer terror from Frugal Hound in your 2012 picture. Priceless! Clever idea on combining Christmas and birth announcement cards! Progress is always something to be celebrating, and being content has as much to do with how you view the future as how you view the past. Happy holidays to you! P.S. Frugal Hound demanded (and received) double treats after that photo. She deserved it! I’m impressed at how you’re able to pull off such a frugal, yet wonderful Christmas this year and these are some really great tips to keep in mind. I was able to score a few things using credit card rewards this year but not all. I did manage to spend only $150 on the kiddo this year which beat my budget of $200 for him. Creating a budget for holiday gifts and spending works best with me and helps keep stay focused on spending less and creating more memories. It’s always a good idea to budget, great work! Helps in the planning, and having a plan keeps you from feeling anxious about how much to spend. Happy holidays! Great job being frugal with your Christmas spending. I myself well be stealing some of your thrifty ideas for next Christmas to reduce my $263 spending total. Glad this was helpful! Nice job on the $263 AND for knowing the number in the first place… which is often 3/4 of the battle. Merry Christmas! Kudos for just pulling it off, $104.17 on Christmas this year. I really love your dog, I wanna take him home. Haha! My frugal tips are that I actually re-use and do DIY decorations with kids and that I stick to my written plans very strictly. 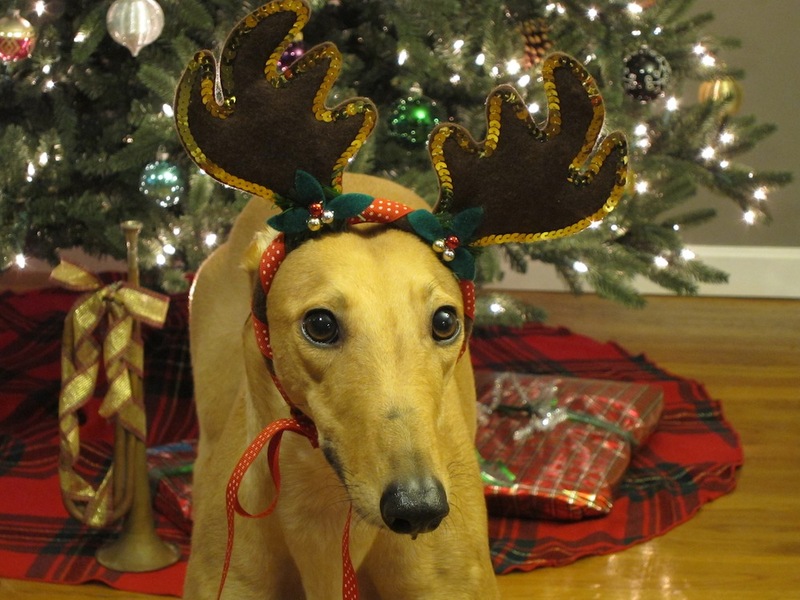 If you’d promise never to put antlers or elf hats on her, Frugal Hound would also love you you to take her home 🙂 DIY decorations tend to be the most meaningful anyway, plus they come at a great price! Merry Christmas to you! Jim and I are not exchanging gifts this year, but we did buy Santa gifts for our daughter. She is probably spoiled, but Christmas and birthdays are just about the only times we give her toys. Plus, I did score a great deal on a huge lot of Judy Blume and Beverly Cleary books on eBay. We did photos for our other family members, and I bartered with the photographer, so that will only cost shipping. We also do Christmas cards. It’s the only way some of our extended family know what we’re up to. That’s a great trick on the postcard size. I might steal that one next year! Really enjoyed the photos! Too cute. We spent a total of $56 for small gifts for grandchildren. Certainly not over the top spending but the stores will just have to count on someone else to prop them up! Wishing you a most Merry Christmas. Thank you! Merry Christmas to you too! And, $56 is a great frugal amount–nicely done. I love love love the idea of using rewards points to buy presents! I’ll have to start saving up my points for next year! Thanks! We were really excited to be able to make that work out this year. Amazon for the win, yet again! We did all our shopping last month and called it good for our Christmas….so all we have under the tree is our daughter’s easy bake oven. We love simplicity and try to make Christmas about fun and family. We open presents and then go visit family and then go sledding or skiing. We try to spend it out of the house. Sounds like a great approach to Christmas! It’s definitely more about fun and family than spending money. Merry Christmas to you and your family! Nicely done! And, I agree, we are definitely saving our sanity too! It’s so relaxing to travel in mid-January–there’s practically no one at the airport :). Merry Christmas and Happy New Year to you! Congrats on the low costs, I applaud you for staying dedicated to the goal. I will keep my gifts and spending under 500 bucks, this year. More than yours obviously, but we have kids, plus nieces / nephews. I like the use of the amazon rewards points, free gifts are always cool. Why thank you! Sounds like you’re also keeping things on the frugal side–nicely done! We were so pleased with those Amazon rewards points this year. Hoping to do that in the future too! Our wedding invitations were postcards…total for 200 plus postage was under $110. Nice trick on Vistaprint. It’s a wonder how normal stuff becomes holiday themed and suddenly jumps in price. It’s a triumph of marketing. On the plus side, that same stuff is usually on deep discount December 26. 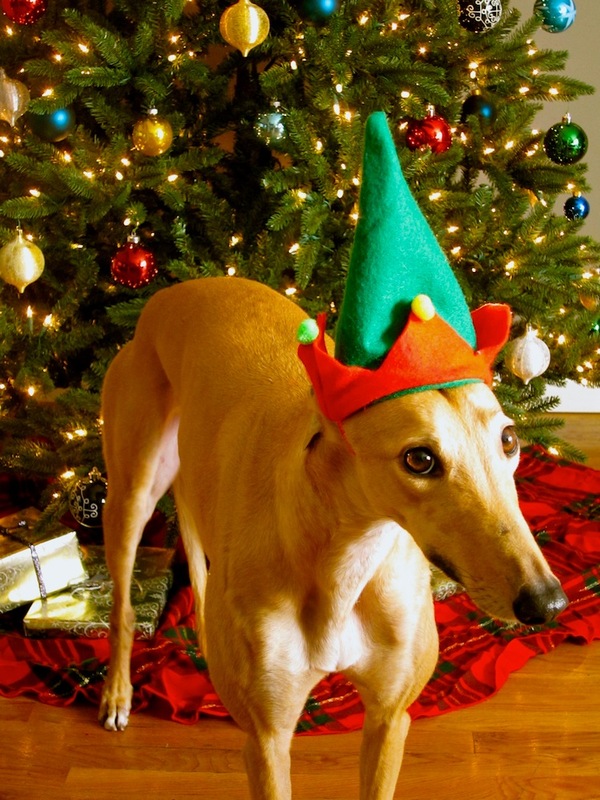 Frugalhound should look into getting a Santa chew toy in January. I gave Marge an electric blanket on your recommendation, which we used for the first time last night. It was toasty, like really toasty after a while, even set on a medium setting. I might just turn it off after the bed is warmed. I can’t wait to re-program the thermostat down today. 15 jars of homemade apple butter covered most friends and relatives for about $45. We sent 12 really nice Christmas cards that were sitting around from previous years, so postage cost only. And then there was some other stuff that made it less frugal which I won’t mention :). I was going to take offense at you calling my favorite Ocean State Job Lot “tackier than Walmart,” but then I remembered what their book aisle looks like… Yeah, I guess it’s pretty bad. I was so excited when I discovered the business postcard section! I thought, hey these are snowflakes–this’ll look like a holiday card :)! We are loving our electric blanket too, but I agree it gets too hot if you leave it on. We usually just “preheat” the bed and then turn it off once we get in. Love this post! I need to do better with my Christmas spending next year for sure. I know I did better this year than years past, but it still wasn’t awesome. Thanks! Hey, better than in years past sounds pretty good to me. Hope you have a very merry Christmas! The damage is still accruing, but if the return trip ends up similar to the drive here, our total will be between $500-$750, which is right on budget even with gifts included. Lower gas prices and switching to using EZPass despite living in a toll-free state saved a bundle on the quadruple toll road section of our drive. Wow–nicely done. I’m continually amazed at your low expenses. That is so good considering you’re including travel and 3 kids! Congrats. Our previous vacation this year was also cheap because of free lodging, in this case with the friends we were visiting. We love staying with friends and family–can’t beat a free and loving place to stay :)! Hope you guys are having a wonderful holiday! Love your festive and frugal Christmas! I think it’s great you guys can still enjoy the holiday without spending. This year my husband and I did choose to exchange gifts, but nothing too extravagant. In past years we have forgone gift giving and instead selected a single, big ticket item we’ve both wanted, like a SLR camera. Now that we live far away from our family (and in SoCal where it doesn’t feel much like Christmas), I do look forward to our gift exchanges and our annual trip to the beach just because it’s there. Reading your blog posts is always a real treat and I thank you for the inspiration! My fiancee and I also agreed on no gift exchange with each other this year and we’re both excited about it. We’re instead putting money towards a nice, fairly frugal Honeymoon next fall to Nova Scotia for beautiful autumn hikes and scenic ocean coastline drives! Merry Christmas and warm wishes! Merry Christmas to you too! Always a pleasure to read your comments :). I love your plan to put money towards your honeymoon–sounds like you have a wonderful destination picked out. Our budget for Frugal Hound’s costumes is nearly $0. Her grandparents love to send her hats and the clothes are actually just mine with ribbons wrapped around the waist :). I did buy that elf hat for $1 at the dollar store and the Santa hat-n-beard was $4 at Target last year. I couldn’t pass it up! Ha awesome! I love the Santa Claus beard on her! Super impressed with your gift spending. That’s phenomenal! I think a problem a lot of frugal people run into (including myself) is getting extended family on board with not exchanging gifts. I have no problem whatsoever with spending $0 on gifts, but getting your siblings, parents, friends, etc. on board as well is sometimes difficult. Thanks! We were so glad we could use our credit card points for all of our family gifts this year–hoping we can continue that trend on into the future! I have friends who only give each other presents that are relevant and function. For example, their son gets a couple of jeans at Christmas every year except for years when he grows very quickly, then he receives another pair whenever needed. I find this actually quite nice since nothing gets thrown into the back of the wardrobe. Wow, I’m impressed! I spent way more than that. But the good news is… I am about to embark on a full year of no spending. So excited about it! I have just discovered your blog and love it. Your life is so different from mine (Our monthly spending is likely equivalent to your bi-annual spending) and you will retire at 33 and I won’t until I am 55 (another 15 years away) but our goal is the same…for a quite homestead in the woods, so I find your approach for getting there so interesting! Anyhow, with holidays rolling around for another year, I am wondering if you have any frugal gift giving ideas for 2015 that don’t involve gift cards from point (we don’t have those)? We have a large list of gifts to buy and I have started making dish clothes and we will do baking to go with them for people like teachers and daycare workers…but we have a large number of nieces and nephews to buy for, along with our own kids. Even with a budget of 25$ per kid it adds up quickly. Not to mention the grandparents etc. I would love to see a new post with your ideas! Thanks for sharing your journey!